Morecambe moved another point close to safety after squandering a late lead at the Globe Arena. Jim Bentley’s players were effectively safe from the drop after Aaron Collins’ penalty gave them the lead with 10 minutes remaining. However, Grimsby Town earned a point they deserved from a disjointed match when Charles Vernam levelled from close range on 88 minutes. The draw, coupled with results elsewhere, leaves the Shrimps 10 points clear of the bottom two going into the final four games of the season. The Shrimps had made one change from the side which drew at Macclesfield Town a week earlier with Richie Bennett replacing Collins up front. Rhys Oates’ hernia problem meant he was omitted altogether but Bentley was able to call upon Vadaine Oliver, who was back on the bench after 11 games out with a knee injury. It was Morecambe who began the quicker of the two sides, literally from the kick-off. Rather than pass the ball back, they advanced straight from the centre circle with Liam Mandeville shooting wide from 30 yards and half-a-dozen seconds on the clock. Moments later and the same player had a shot blocked after Grimsby keeper James McKeown punched Piero Mingoia’s cross away from goal. 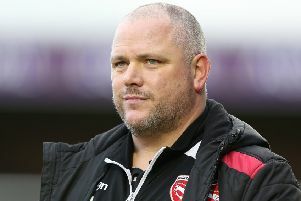 Kevin Ellison also lashed an effort over the bar as the Shrimps started on the front foot despite playing into the wind. However, the visitors worked their way back into the game as the half progressed with Barry Roche making a low save to keep out Vernam’s header. A more unconventional stop saw the Shrimps’ keeper kick out Joe Grayson’s long-range shot, while Martyn Woolford’s effort was deflected just wide of goal by one of his team-mates. Roche continued to be the busier of the keepers with a scrambling save from Danny Collins’ header before pushing out Vernam’s effort moments later. The best chance came 10 minutes before the break when a cross found Grayson, all alone, 12 yards out but he ballooned it over the bar. Aaron Wildig curled a shot off target and Mandeville had another blocked as half-time arrived with honours even. With the game becoming increasingly scrappy, Bentley opted to shuffle his pack in search of a breakthrough. On came Oliver and Collins with one goal increasingly looking like it would settle matters. 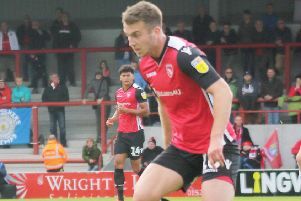 Grayson had a free-kick blocked by the Morecambe wall but clear opportunities remained at a premium. With the crowd increasingly resigned to a goalless draw, the deadlock was finally broken in the 80th minute. Andy Fleming’s long ball forward saw Collins beat the last man for pace before progressing into the area. He tried to round McKeown, only to be brought down by the keeper, but then sent him the wrong way from the spot. However, with time running out, the visitors drew level when Kristian Dennis controlled a ball in from the right and his cross was converted by Vernam. Despite four minutes of added time, neither side could find a way through and had to settle for a point apiece. Morecambe: Roche, Mills, Lavelle, Old, Conlan, Mingoia (Cranston 79), Fleming, Wildig, Ellison (Collins 67), Mandeville, Bennett (Oliver 63). Subs not used: Halstead, Kenyon, Sutton, Brownsword. Grimsby Town: McKeown, Hendrie, Davis, Collins, Ring (Whitmore 83), Vernam, Hessenthaler, Woolford (Hall-Johnson 83), Grayson, Cardwell (Clifton 76), Dennis. Subs not used: Russell, Buckley, Burrell, Pollock.